Be the first to share your favorite memory, photo or story of Theodora. This memorial page is dedicated for family, friends and future generations to celebrate the life of their loved one. 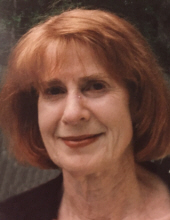 Theodora Foran Jones, 90, of Hamden, wife of the late Thomas R. Jones passed away November 14, 2018 after a brief illness. She was born in New London, CT on May 23, 1928, a daughter of the late John Kennedy Foran and Valerie Shannon Foran. She resided in Meriden for many years before moving to Hamden in 2014. She was a parishoner of St. Rose of Lima Church in Meriden, and enjoyed gardening, decorating, music and dancing, as well as volunteering to raise money for cancer. Theo was a devoted mother, wife and daughter who loved to laugh and was kind to everyone she met. Her family would like to express their appreciation to the staff of Atria Larson Place for their loving care. She is survived by her children Katharine (David) Law of Reston, VA, Thomas R. (Deborah) Jones, Jr., Suzanne (Tom) Mach of Hamden, Elizabeth V. (Windsor) Hall of Darien, and Christina (Ty) Tompkins of Wallingford. She is also survived by her niece Valerie Carter and her grandchildren Matthew, Windsor III, Shannon, Thomas, and Bridget, and step-grandchildren Steve, Michelle, Christine and Cassie. In addition to her husband Thomas, Theo is predeceased by her siblings, Katharine Foran, John Kennedy Foran, Jr., Valerie Foran Knox and Thomas Shannon Foran. Relatives and friends are invited to attend a Mass of Christian Burial in St. Rita Church, 1620 Whitney Ave., Hamden on Monday, November 19 at 10 AM. Burial will be in St. Mary's Cemetery, Norwich. To send flowers or a remembrance gift to the family of Theodora Foran Jones, please visit our Tribute Store. "Email Address" would like to share the life celebration of Theodora Foran Jones. Click on the "link" to go to share a favorite memory or leave a condolence message for the family.